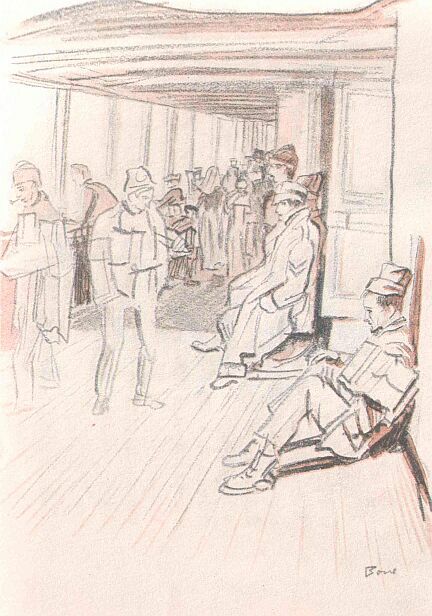 Weather permitting, walking wounded usually travelled on the deck of the overcrowded hospital ships for the short crosschannel passage from France to England. Their passage to England is illustrated by the following three sketches. 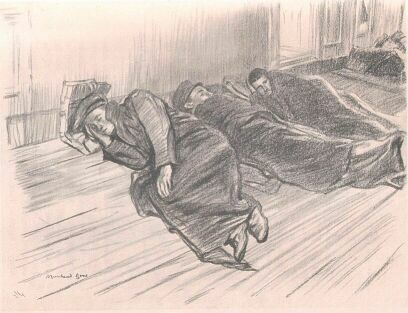 The best place to sleep, on a summer night in a full hospital ship, for a man whose wound is not grave enough to cause serious "shock" and consequent need of much artificial warming. This drawing was done in the warm early autumn of 1916. 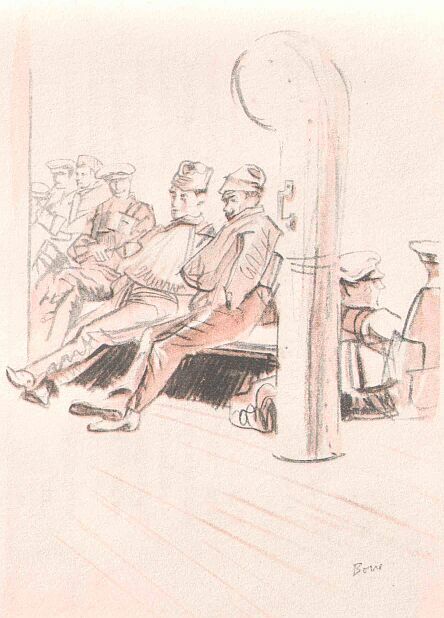 All "walking wounded" wear lifebelts, if their injuries permit, during the Channel crossing, and each "stretcher case" has a lifebelt under his pillow, if not on. The necessity for this, in a war with Germany, has been proved by the fate of too many of our hospital ships. The deck of a British hospital ship is one of the most cheerful places in the world. Every man is at rest after toil, is about to see friends after separation, can smoke when he likes, and has in every other man on board a companion with whom endless reminiscences can be exchanged, and perhaps the merits and demerits of the Ypres salient, or the most advantageous use of "tanks," warmly debated, as is the custom of privates of the New Army. Silent or vocal, a great beatitude fills the vessel.